We all know that Blackjack is one of the classic casino games and it’s almost as compelling to play online as offline. 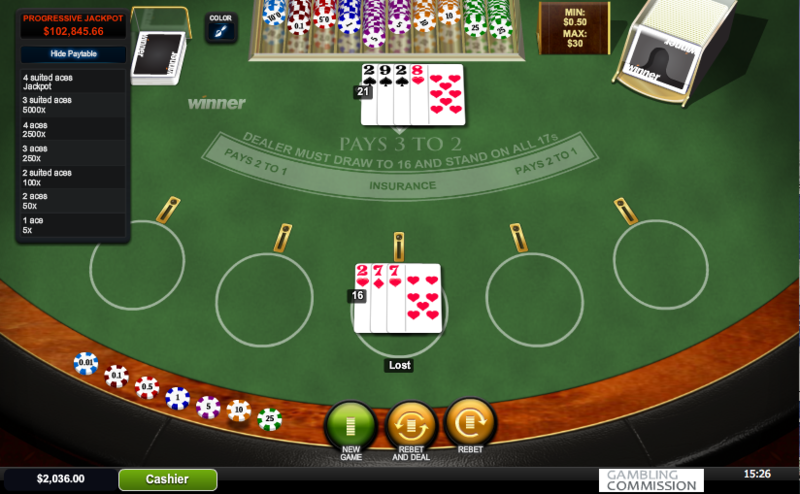 Various online casinos offer variations on the Blackjack theme with slightly differing rules so that the experimental players have something new to try. There’s no guesses as to what the extra incentive is when you load up Playtech’s Progressive Blackjack. Open up this game and you will see immediately that it is a five-handed version which means you can play up to five hands simultaneously. Get started by choosing your stake from the chips available in the bottom left hand corner – decide how may hands you want to play and then place one or more chips in the circles to show that. When the hand is over you will be paid out if you are a winner; the dealer stands on 17 or higher and when finished, your hands will be compared. Any blackjacks are paid out at 3/2, other wins at evens. You can see the jackpot total in the top left hand corner under which is the paytable which explains how the prize is won. To take part though you must drag a chip to the small slot above your betting circle – the jackpot available for you is based on your bet size. To win the big bucks the first four cards you land must be Aces of the same suit; this is possible because six decks are in play here and so there are six matching Aces available. The full list of prizes are shown in the paytable to the right. We like the addition of the the progressive jackpot although it does lower the RTP to 94.85% to 99.53%. If you want that higher percentage, check out our Blackjack strategy page for more information.